To take advantage of the promotion click here, enter your zip code and select your mall, fill out the information form and print out your confirmation e-mail and follow its instructions. You must spend a minimum of $75 at a participating mall to qualify for this gift card promotion which should not be too hard considering all the back to school shopping that needs to be done. After you have collected $75 worth of receipts you can take them to the Shop Smart Zone in your local mall to collect your free $10 mall gift card. If you have completed your monthly shopping and have no need for your free $10 gift card consider turning the gift card into cash. Giftah is a online marketplace for gift cards. You can sell your gift cards directly to Giftah or list it on the site in a gift card auction. Its a great way to get some cash for your unwanted gift cards, it is also worth checking out before you do your back to school shopping due to its large selection of discount gift cards. 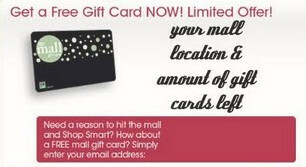 Its the one step destination for all your gift card needs. This entry was posted on Monday, August 31st, 2009 at 5:20 pm	and is filed under Buy Gift Cards, Gift Card Promotion, Gift Cards. You can follow any responses to this entry through the RSS 2.0 feed. You can leave a response, or trackback from your own site.